The Mynabirds at The Waiting Room, March 23, 2012. I don’t know if that’s supposed to be a fox or a coyote or a wolf plopped upon Laura Burhenn’s lovely head. For you vegans in the audience wondering, it’s not real, though the spirit of it is (However, it would have been even more effective had it been a griz head, just like ol’ Bear Claw’s in Jeremiah Johnson). Everywhere she goes these days, Burhenn is photographed with that stuffed animal on her noggin, representing, what… rebellion? or the death of it, because nothing says futility more than the head of a dead animal balanced on your head, even if it resembles a plush toy. Still, the crowd loves it, and when Burhenn put it on again at the end of the show, they went nuts, so I guess we all better get used to seeing it. If anything, it represents Burhenn’s new music, or her departure from the old(er) stuff from her debut. Friday night at The Waiting Room was the first time I’d heard any of it, and my impression is that she’s taken a hard right turn toward drama — even stoicism — on stage. All those months backing Conor on last year’s Bright Eyes tour pumped up the “importance” of her approach, as evidenced by her announcement about three songs into her set that her new album, Generals, is a a protest album with “a lot of anger.” She seems to have volunteered to take on the role as front piece for a movement that isn’t terribly well defined, but that she’s very serious about, and you should be too, even though a lot of what I heard Friday night sounded like love songs. According to the press release, the forthcoming album, which arrives in June, “is both a protest record and concept album. It’s fueled by a full decade of Burhenn’s political frustration and aimed at finding a revolutionary yet pacifist way in a world where, these days, it seems warring comes quick.” The record is “filled with armies of stomps and claps, sweeping full spectrum orchestrations, and moments that range from intensely personal pleas to shout-out-loud protests with teeth.” For me, the best protest music is more subtle than that. Dylan’s best moments are met through metaphor. And some of the best ’60s political commentary is outlined in humor. Even Conor’s best political statements are draped in clever irony (“When the President Talks to God,” is an obvious example). Go too far with it, and you risk sounding too self-serious or preachy. Whether Burhenn suffers that pitfall, I’ll withhold judgement until I hear the record. That said, such earnestness was marked as much by Burhenn’s between-song patter as the songs themselves, which you couldn’t really absorb from the stage Friday night. At one point, Burhenn congratulated the crowd for their support in getting the LGBT ordinance passed by the City Council, but added that the fight isn’t over yet, and that we’ll all be hearing more about it in the future. Yes, indeed. Despite the politics, most of the evening was dedicated to music and Burhenn’s new band. Gone are all the original members that hailed from Omaha — Johnny Kotchian, Dan McCarthy, Pearl Lovejoy Boyd, Ben Brodin and Alex McManus. I don’t know the story behind their departure, but have been told it had to do with touring availability. I can’t seem to find a listing of the new band members anywhere, but will say they all had the tact and talent of veteran support folks or session players. None of them stood out, but all were competent. 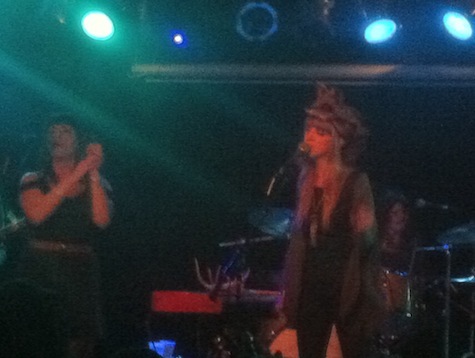 This galvanizes the idea that The Mynabirds is fully a Laura Burhenn project. If so, why not just go by the name “Laura Burhenn,” especially if you intend to put your politics out front? Look, I realize I’m asking more questions than providing a review. Musically, it all sounded fine. The new stuff seemed less orchestrated and more poppy than the songs heard on the first album (which as a result, is a record I’ve come to appreciate even more). It’s too early to say if there will be a song on the new album as gorgeous as “Right Place” or as sing-along fun as “Numbers Don’t Lie.” Burhenn seems destined to be compared to Jenny Lewis, whose own music feels less constrained and more easy-going than Burhenn’s. But then again, Lewis isn’t a self-proclaimed writer of protest songs. Opening band Big Harp continued on the hard(er) electric path that I briefly heard unveiled in Austin at SXSW. If you liked the simple acoustic two-step of songs like “Goodbye Crazy City,” you might be disappointed with the new blues explosion approach that recalls The Black Keys more than, say, Justin Townes Earle or Willie Nelson. Luckily, frontman/guitarist Chris Senseney has more than enough guitar and vocal prowess to pull it off and give Dan Auerbach a run for his money.